The month of April is full of events, and the Pylon Network team is ready to face each one of them. 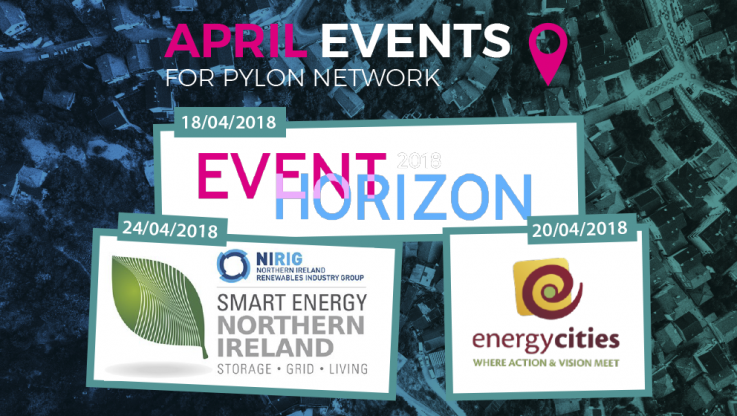 These are conferences and events of great importance coming up this month and Pylon Network will be there covering a range of topics: blockchain, energy, citizen cooperation and innovation. It will undoubtedly be a great opportunity on one hand, to promote Pylon Network and spread the word on the latest development of the project and on the other hand, to get a good sense of the current status and developments in projects and companies that are working on the energy digitization sector. Find all the details and dates for each of April’s events, below. EventHorizon is the ONE exclusive annual event centered on energy blockchain solutions for a future based solely on renewable resources. It is a game-changing platform for the development of a customer focused, fair energy future. Once a year, EventHorizon unites the Who’s Who of both the traditional energy and innovative blockchain sectors. The energy market is at a turning point. Leading experts agree that blockchain technology has the potential to shift the whole industry. Decentralized digital platforms will change the way people buy and sell energy. Blockchain technology enables us to build verifiable, secure peer-to-peer structures and it conciliates the use of data and privacy. In turn, this means that there will be a shift of perspective in our daily life. EventHorizon brings together pioneers, experts and visionaries of both worlds, the energy and blockchain sectors, resulting in a powerful melting pot of diverse perspectives, innovations as well as informative content. The summit is predestined to leave a mark in the attendees way of looking at the future of energy. The event serves the best interests of all sectors attending with deep dive sessions to broaden the horizon and start-up pitches to experience the latest breakthroughs. Also, EventHorizon breaks new ground when it comes to the event experience, explores new event possibilities and interacts on new levels never seen before. Our zero-carbon future is built through partnerships that are wide-ranging, both in scope and scale. Democratic because good urban transformation and local energy policy involves all stakeholders. Sovereign, because innovative local development will be based on local resources; United, because cities connecting with each other, with their rural surroundings and with different other governance levels make up for a collaborative European territory. In 2018 in Rennes, the flagship event of our network is meant to power those partnerships with people and ideas. After seven years dedicated to bringing the best renewable energy industry insights to Northern Ireland, NIRIG is launching a ‘Smart Energy’ programme of events to respond to the new challenges facing the energy industry. The first NIRIG Smart Energy event in Northern Ireland will be held on Tuesday 24 April 2018 at the MAC Belfast. Smart Energy Northern Ireland 2018 brings together experts to discuss future energy systems and how innovative, forward-thinking organisations can become leaders in energy technology, management and trading. The renewables sector has experienced significant growth in Northern Ireland, and is on course to reach a target of 40% electricity from renewable sources by 2020. Simultaneously there are challenges and new developments in network management and NIRIG membership wishes to drive forward the discussion on a smart energy system of the future, powered by renewables. Attendees will hear from expert speakers on topics including energy storage, smart energy systems, digitisation and network management. If you are near and you want to attend any of these events, do not hesitate and register now.